killingtonblog.com, Killington Vermont: Spring renovations completed.The 70's called!They wanted their avocado green tile back! They wanted their avocado green tile back! When you own a very large building that is open 365 days a year to the public, your tool kit is always nearby. Sometimes the projects are very minor like changing a light bulb or (yck) plunging a toilet. Other times, the projects take on more life. You have to figure out how something was built so you can put it back together again. Or, you just destroy everything and build it over again. it's all in a days work with you run an inn. Some time around 1970, in the history of the building that is now our home and the Birch Ridge Inn, what is now Room 2 (the Antique Lace Room) Room 3 (the Shaker Room) and Room 4 (the Colonial Maple Room) were built. 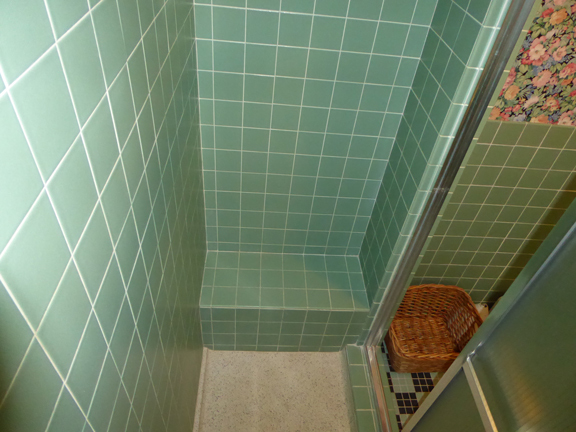 Lovely avocado green tile, which was de rigueur at the time, was chosen for the design. 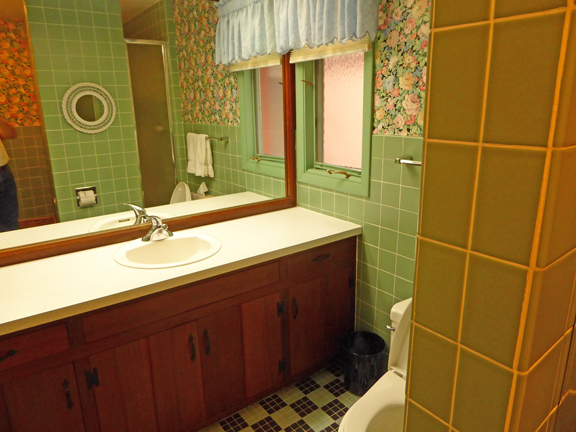 Contrasted with built in formica counter tops, and rustic stained pine trim, and these bathrooms were all the boss in 1971. Fast foward 50 years. The formica is scratching. The avocado tile....well it's avocado tile.... (thank god we did not have orange shag carpets to go with it!). A change was needed. Our spring projects this year were pretty clear! The overall design concept was very straightforward.....rip out the green tile! In addition, delicately removing the old countertops to preserve the vanities was key to the project. We knew we could modernize the vanities by sealing them and painting them with a black enamel. But they needed to be intact to allow that to happen. 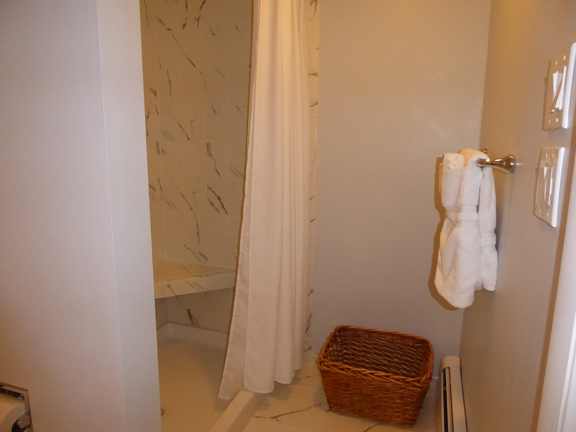 The bathrooms in Room 3 and 4 were partially rebuilt when we did the original construction of the inn. The effort in Room 3 was mostly cosmetic, with the old wallpaper being removed in favor of a custom paint job. Room 4 was a little more complicated. 2 walls of green tile were removed and replaced with new sheetrock. The vanity and the frame around the 6ft mirror were totally refinished. New light treatments above the vanity were installed. New moulding was added to finish the entire room. And then, of course, multiple new coats of paint. Room 2 was a bigger effort. The bathroom was brought down to studs, as well as the old popcorn ceiling in the room itself. The old tile was very well installed, as there was minimal repair needed, other then rebuilding the shower wet wall. I installed a new shower tub, new concrete board as an underlayment for new tile, and new sheetrock through out. A new sink, toilet (comfort height of course) and new light treatments were also added. 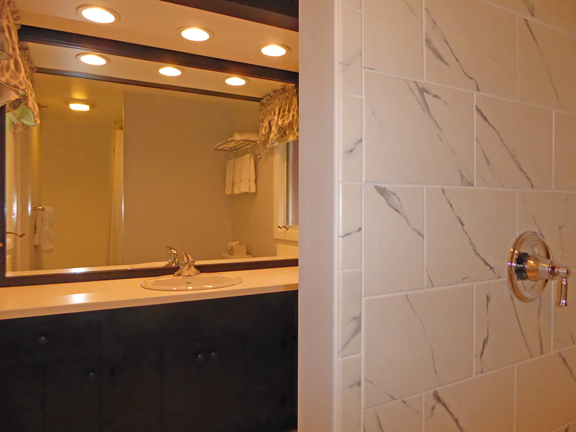 With the help of our plumbing contractor, and our tile guy, the overall project lasted about 8 weeks. Room 2 proper also saw some changes. The old popcorn ceiling was replace. New ceiling trim was installed to liven up the room. New window treatments were installed to compliment the new paint job. We are ordering a new loveseat for the room to complete the total make over. It's been a busy spring. With the sheet rock dust out of our hair, we have now moved outside the inn. Mary is busy working on her gardens. Her dahlia's are just relishing the moist weather we have had early this summer in the green mountains. I have been busy battleing bears attacking our dumpster. "Casa Casella" is the next project on the list. As i see it, if you are not on the golf course, you might as well be using a power tool! Where ever you may be, have a great summer. Keep it in the fairway. And don't forget your sun screen.